« INFINITE Holds a Google+ Event with Fans While in Japan for ‘Summer Sonic’ Festival! Photos of Sungyeol‘s forward-thinking(?) 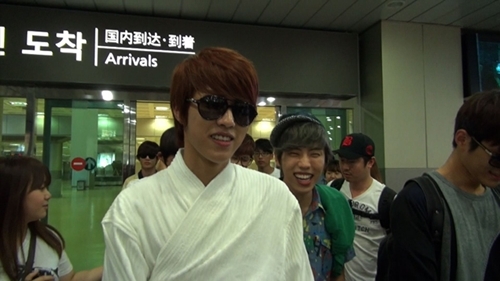 airport fashion was revealed just last month, leaving fans laughing while wondering why the INFINITE member was wearing a bathrobe at the airport. It looks like the story behind the singer’s wardrobe choice will now be revealed on the upcoming episode of MBC‘s ‘Weekly Idol‘ airing August 15th. After wrapping up promotions for their third mini album title song “The Chaser“, INFINITE headed to Jeju island to film a music video as well as take some time off. The day they arrived on the island, the members all excitedly gathered in one room to play games and enjoy their short vacation. However, with great games come great punishment. As agreed upon by the members, brutal ‘airport fashion’ was selected as the loser’s punishment, raising the stakes of the game. Because the punishment required the ‘loser’ to be seen by numerous fans and reporters at the airport wearing the outfit chosen by the other members, it was said that even the less talkative members like Hoya displayed their competitive side and put in all of their efforts to avoid being the unlucky individual. Catch the full story behind Sungyeol’s bathrobe fashion as well as details from the boys’ trip to Jeju on the episode of ‘Weekly Idol’ airing later today (August 15th)! 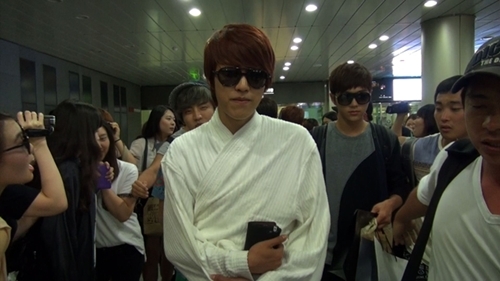 This Post was posted in BEHIND THE SECRET, NEWS and tagged Airport Fashion, Hoya, MBC's Week Idol, Sungyeol, The Chaser. Bookmark the permalink.